Mary Brave Bird grew up fatherless in a one-room cabin, without running water or electricity, on the Rosebud Indian Reservation in South Dakota. Rebelling against the aimless drinking, punishing missionary school, narrow strictures for women, and violence and hopeless of reservation life, she joined the new movement of tribal pride sweeping Native American communities in the sixties and seventies. Mary eventually married Leonard Crow Dog, the American Indian Movement's chief medicine man, who revived the sacred but outlawed Ghost Dance. 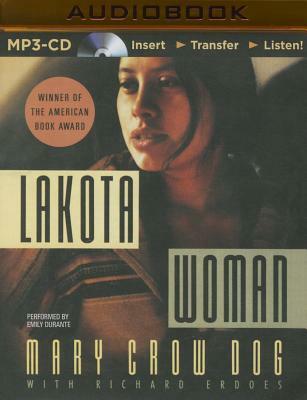 Originally published in 1990, Lakota Woman was a national bestseller and winner of the American Book Award. It is a unique document, unparalleled in American Indian literature, a story of death, of determination against all odds, of the cruelties perpetuated against American Indians, and of the Native American struggle for rights.